Tonight was the Labor Day Camp Reunion and boy were there A LOT of memories. 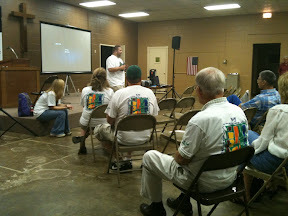 Labor Day Camp has been a tradition at Twenty-Sixth Street Baptist Church since 1954! From Friday until Monday kids and adults are having fun and getting closer to God. We had dinner, then Shelly put together a slideshow/video that was about an hour long. It had pictures from WAY back, probably before I was born, a few from when I was younger and several of our skits. The skits were from 2001, 2003 and 2004. My personal favorite was entitled "This is Rick" where the guys who used to work for him did a skit about working for him, from driving with no hands drinking coffee and talking on the phone, to driving in the snow with the top down on the Jeep. We also talked about vespers. Those were the times during camp where we got so close to God. They had vespers tonight, but it was cold and time for Tristan to go to bed, so we went home.